2017 will mark the return to Carmen’s creole roots with a new album called CREOLOGY, which she is performing at Kings Place on September 30th. Carmen Souza was born in Lisbon (81) within a Christian family of Cape Verdeans. Very early she experienced the “Sodade” feeling of missing someone with the long absence of her father due to his work at sea. She grew up in a mixed language environment of Creole, the Cape Verde dialect her parents spoke at home, and Portuguese, always surrounded by the Cape Verdean way of life. Theo Pas’cal, her producer and mentor and one of the best bass players in Portugal, discovered her talent and introduced Carmen to Jazz and other contemporary sounds that markedly influenced her musical development. Musicians like Theo Pascal, Horace Silver, Ella Fitzgerald, Billie Holiday, Nina Simone, Joe Zawinul, Herbie Hancock, Keith Jarret, Bill Evans, Miles Davis, etc, truly inspire her evolution and search for a unique personal style. Ess ê nha Cabo Verde, was released two years later in 2005 to critical acclaim and led to her international breakthrough performance at the WOMAD at Reading Festival of the same year. In “Verdade” her second album, which She co-produces and features on Wurlitzer and guitar, released in 2008, Carmen Souza signs an exciting and melodically vibrant repertoire in Creole that once again received amazing reviews from the International Press worldwide. 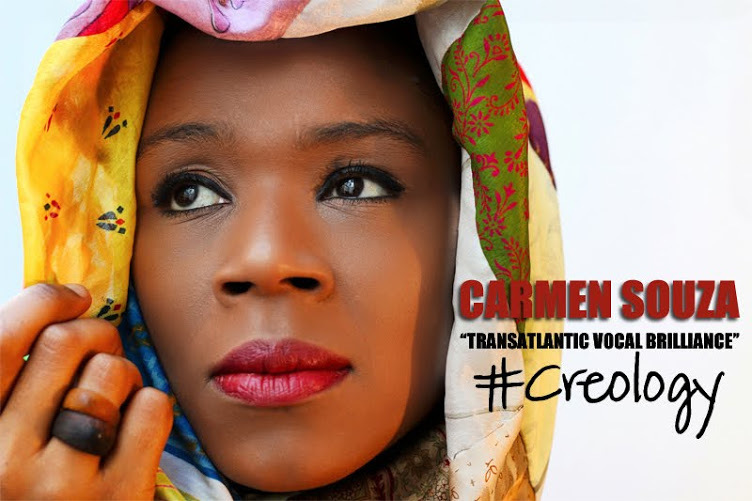 After 2 critically acclaimed albums, Carmen Souza returns in 2010 with the impressive “Protegid” (Protected) that blends perfectly with elegance and sophistication the African and Cape Verdean traditional rhythms with Contemporary Jazz and Afro-Latin. Once again the two composers, Carmen Souza and Theo Pas’cal, present an album that pushes even more the limits of what constitutes the Cape Verdean music, World Music and Jazz. Carmen co-produces, plays guitar, Rhodes and signs 11 out of the 12 lyrics of the album. In Protegid, Carmen Souza singular vocal approach and courageous musical chooses earned her pairing with singers like Billie Holiday, Nina Simone, Cleo Laine, Eartha Kitt or Marie Daulne. Her Unique talent as a singer, composer and musician sets her apart from the female crowded Cape Verdean scene and progressively she is consolidating her own space in the World Music/Jazz music. This new album received outstanding reviews from all over the World and the Press recognizes that something new is being developed in her music. World Music Central considers the album: “a landmark that will prompt you to embrace and at the same time rethink everything you know and love about the sounds of Cape Verde”, NPR says: “opens a window to another world entirely” and The Independent declares: “the poetic voice is as original as the musical one”. Protegid received a nomination for the German Record Critic’s Award, enters the World Music Charts Europe in April and was included in the list of pre-nominated albums for the Grammy Award for Best Contemporary World Music album . A new edition of Verdade, her second album re-issued in 2010 by Galileo, also enters the WMCE in August and by the end of the year Protegid was included in several lists of “Best World Music Album 2010”. Carmen Souza have been touring extensively around the World since 2005 and in 2010 she plays big stages like The North Sea Jazz Festival(NL), London African Music Festival(UK) or the Leverkusener Jazztage Festival(DE). In Leverkusener, Carmen Souza, headlines a double bill with Mariza with an amazing performance later broadcasted by WDR/3SAT German TV. Other concerts were also broadcasted around the world by major TV/Radio Channels like CBC(CA), RDP/RTP(PT), RADIO6(NL), etc, and her uniqueness is recognized by Ethnomusicologists Gerhard Kubik and Fernando Arenas. A closer look into Carmen Souza groundbreaking work was published in a new book called “Beyond Independence: Globalization, Postcolonialism, and the Cultures of Lusophone Africa” by Fernando Arenas released by the University of Minnesota (USA). Special mention to her first Official North American Tour with 14 dates in several states receiving opening honours at San Francisco Jazz Festival, Monterey Jazz Festival and also performing at Montreal Jazz Festival. Carmen´s Monterey Jazz Festival concert was web broadcasted live, by the first time in the Festival history and transmitted direct by NPR. Another year highlight was Carmen Souza first concerts in Cape Verde with full coverage in all national press. The concerts receive great reviews from Press and Audience and all recognized her special and unique place in the Cape Verdean music culture. In 2012, Carmen Souza and Theo Pascal released a special live Duo performance recorded in London ” LONDON ACOUSTIC SET”. This was their first live record and the naked versions of her songs from previous albums receive rave reviews from both the Jazz and World communities. 50% of the sales from this album were donated to SOS Children Villages in Cape Verde and Unicef Brazil. Carmen Souza’s 4th Album KACHUPADA was released in France and Germany in 2013. In France the album entered directly to the official sells Chart for World Music and went number 1 on the Amazon.fr Songwriters bestselling list. KACHUPADA received maximum note at Télérama magazine (French most important musical reviewer) and was supported by Vibrations and Sojazz magazines beside other excellent reviews and playlist on national radio RFI. Carmen Souza was also Cover of the Cap Magelan Magazine, the biggest lusophone magazine in France. In Germany she released the album with a 13 date tour supported by Jazzthetik Magazine and the album was featured as Cd of the week in Major Radios and highlighted by National Tv. After the goodbye of the biggest Cape Verdean singer, Cesária Évora, Carmen Souza is named has one of the new generation singers to continue the successful path of the Cape Verdean music. Also in 2013 Carmen Souza won the title of Best female singer and Best Morna with the album Kachupada at the Cape Verdean ‘Grammys’- Cabo Verde Music Awards 2013. After a hectic year with concerts in Major Festivals and venues all over the World, Kachupada is included in several Best Album lists and Carmen makes it to the #31 Best Vocal at the 2013 NPR Jazz Critics poll together with a position for Best New album right next to all the greats of Jazz in the World! In 2014 Carmen Souza and Theo Pascal released their first Live CD-DVD recorded at Lagny Jazz Festival in France. ‘Live at Lagny Jazz Festival’ was nominated for the German Records Critics Award and Carmen Souza was again nominated for Best Female Voice at the Cabo Verde Music Awards. The cd/dvd made it to Top10 at Amazon.fr, Amazon.de & Fnac.fr. A 65 concert tour around the world, closed with a Sold out tour in Germany goes along with this new release. 2015, is time for ‘Epistola’ CD, headed by both Carmen Souza and Theo Pascal names. The album/concert is selected among more then 500 submissions to be included at the JAZZAHEAD2015 official showcase program, the most important jazz showcase event in Europe. The concert featuring Nathaniel Facey on Sax and Shane Forbes on Drums, two of the most innovative new generation Jazz musicians of the London scene. Receives 4STARS in both JAZZWISE and EVENING STANDARD important publications in UK. The live recording from the ´Epistola´ Jazzahead concert went on to be Broadcasted by major radios like FIP in France, Catalunya Radio in Spain and RTÉ Lyric fm in Ireland, etc. After 76 concerts around the world in 19 different countries and important stages, Carmen Souza ends the year with a nomination for BEST AFRICAN JAZZ at the important African Awards AFRIMA 2016. Undoubtedly, Carmen Souza have become a true world music force and one of Europe’s most in-demand jazz singers, as someone said: “Carmen Souza does not have to decide whether her music is Jazz or ‘World Music’. Her style is just as unique as convincing and her Cape Capeverdean roots as evident as her desire to create a new language under the label of ‘World Jazz’. 2017 will mark a return to her creole roots with a new album called CREOLOGY.